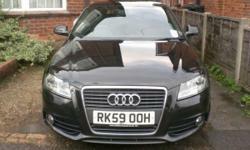 XENONS / BOSE / NAVIGATION / DVD / MULTI-CD / MEMORY HEATED LEATHER SEATS etc. 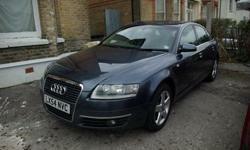 The car in brief; Audi A6 trimmed in range topping "S Line" specification. 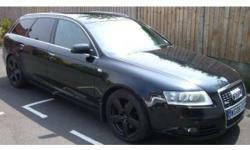 spec includes gorgeous AUDI 19" wheels(cost over £1000 with nearly new tyres) and S Line body enhancements. Bigest Audi DVD player and bluetooth phone preparation. 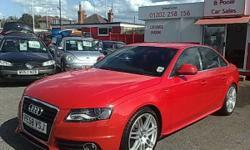 Powered by the superb 245ps / 3.0 litre V6 TDI QUATTRO engine with Multitronic automatic transmission (with 7 speed ). Finished in Silver with black leather interior inc. heated front seats. XENONS / LED/ NAVIGATION / DVD / MULTI-CD / HEATED LEATHER /MEMORY FOR BOTH FRONT SEATS /REAR CLIMATE CONTROL, etc. ABS brakes with Brake assist. ESP – stability and traction control. Auto boot opening from remote key or from button on door card. Audi Parking plus with front and rear park distance sensors,omplete with acoustic,visual aid. Special edition RARE sports seats trimmed in full black leather. Tilt and reach adjustable steering column. Colour MMI (Multi-media interface) with DVD/SD/Bluetooth input. Full colour screen satellite navigation also big colour dash screen. Front and rear arm rests. Stilish wallnut embellishment trim with night ambiental interior led`s. Rear ventilation with zone temp controls. 3 spoke multifunction steering wheel trimmed in leather.